This Dodge Demon Is Custom Built To Dominate! Custom built for a private collection several years ago this 1972 Dodge Demon is a fully streetable track ready monster. With no expense spared and only top shelf components used, immaculate appearance, racing style interior and plenty of go fast mods this Mopar is nothing but a real deal muscle car. 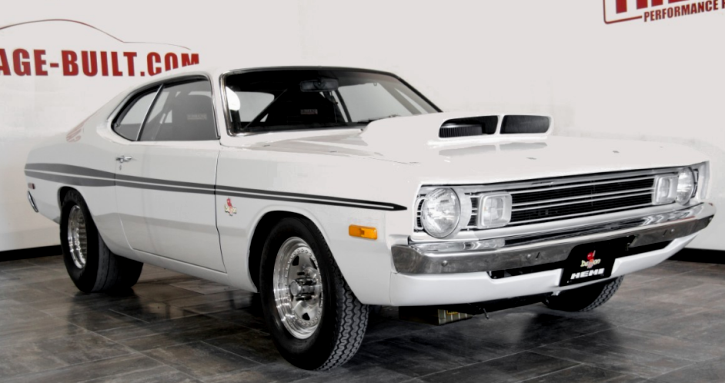 When we talk about performance this Pro Street 1972 Dodge Demon sports a Mopar Performance 475 cube HEMI V8 mill equipped with Childs and Albert rods, Venolia pistons, Comp Cam, Aluminum heads, Indy intake and 1150 Dominator carburetor. Hell of a combo resulting in 720 horsepower plus additional 100 shot of Nitrous controlled by manual transmission with torque convertor and Dana 60 rear differential. Check out the video brought to you by Garage Built and don’t forget to SHARE!